Staining of equine peripheral blood lymphocytes with Mouse anti Horse CD11a/CD18 (MCA1081GA), followed by Goat anti Mouse IgG:FITC (STAR117F). Staining of equine peripheral blood lymphocytes with Mouse anti Horse CD11a/CD18:RPE (MCA1081PE). Staining of equine peripheral blood lymphocytes with Mouse anti Horse CD11a/CD18:FITC (MCA1081F). Figure A. FITC conjugated Mouse anti Horse MHC Class I Monomorphic (MCA1086F) and RPE conjugated Mouse IgG1 isotype control (MCA928PE). 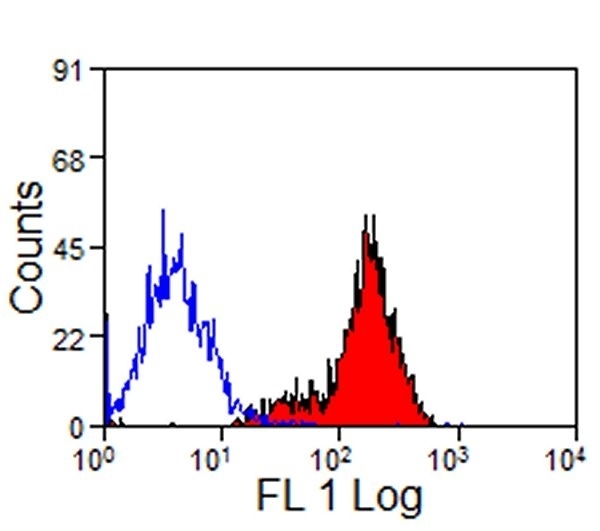 Figure B. FITC conjugated Mouse anti Horse MHC Class I Monomorphic (MCA1086F) and RPE conjugated Mouse anti Horse CD11a/CD18 (MCA1081PE). All experiments performed on red cell lysed horse blood gated on lymphocytes in the presence of 10% horse serum. Data acquired on the ZE5™ Cell Analyzer. 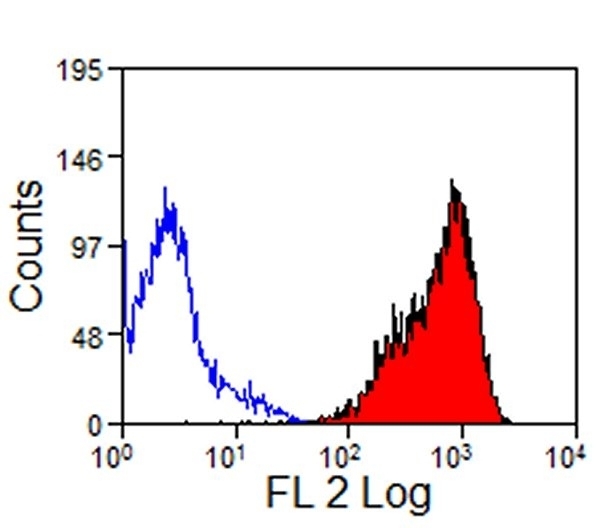 Mouse anti Horse CD11a/CD18 antibody, clone CVS9 recognizes the equine homolog of the human CD11a/CD18 cell surface antigen, a hetrodimer expressed on all equine cells of haemopoietic origin. Studies have indicated that equine CD11a/CD18 has higher expression on some subpopulations of T-cells. In addition to the CVS9 clone, other CVS clones recognising equine MHC and cell surface antigens are available from Bio-Rad. Xu, J. et al. 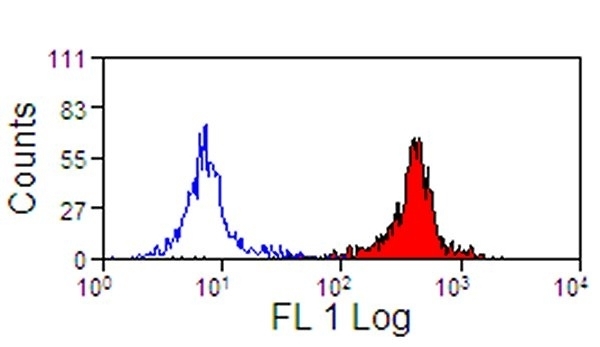 (2008) Characterization of equine P-selectin glycoprotein ligand-1 by using a specific monoclonal antibody. Vet Immunol Immunopathol. 121 (1-2): 144-9. Hammond, S.A. et al. (1999) Functional characterization of equine dendritic cells propagated ex vivo using recombinant human GM-CSF and recombinant equine IL-4. Vet Immunol Immunopathol. 71 (3-4): 197-214. Laval, K. et al. (2015) Equine Herpesvirus Type 1 Enhances Viral Replication in CD172a+ Monocytic Cells upon Adhesion to Endothelial Cells. J Virol. 89 (21): 10912-23. McClure JT et al. (2001) Immunophenotypic classification of leukemia in 3 horses. J Vet Intern Med. 15 (2): 144-52. Schröck, C. et al. (2017) Bone marrow-derived multipotent mesenchymal stromal cells from horses after euthanasia. Vet Med Sci. 3 (4): 239-251.